» Temperature and discharge data for lake NE 14 Outlet near Toolik Lake, Alaska, during the 2010 summer field season. We established a rating curve for the Lake NE14 outlet by making manual discharge measurements in the summer, unfrozen season and relating them to the water depth (pressure) measurements made with a Win-Situ Troll transducer. The rating curve and pressure data were then used to construct a continuous record of discharge for the summer (measured every 10 or 30 minutes). 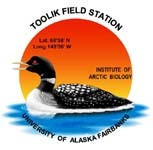 The detailed discharge measuring protocol is found in the LTER Landwater manual accessible from the Landwater mainpage on the Arctic LTER web page or at http://www-personal.umich.edu/~gwk and clicking on the protocol link at the bottom of the page. Temperature measurements were logged by the Troll instrument. Definition: Sampling Time in Alaska Daylight Savings Time using 24 hour convention. Daylight Savings time is 1 hour ahead of Alaska Standard Time: e.g., if time is 13:00 DST then it is 12:00 AST.